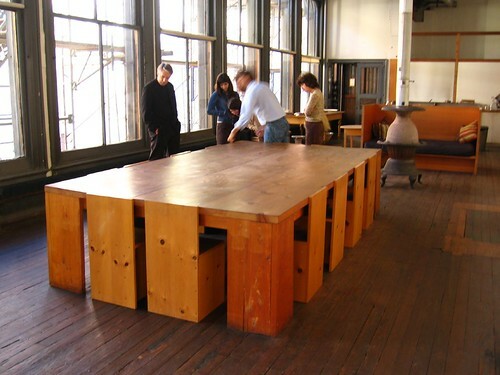 This is artist Donald Judd’s loft in Soho, maintained as a museum and open for viewing after recent restorations. It was one of the first artist’s lofts in Soho – not to mention in New York – and is now almost the paradigmatic example of loft living. Judd bought the entire 1870’s industrial building for 70,000 in 1968 and moved in with his family. One of the central figures in minimalist art, Judd lived his own aesthetic in a space he referred to as “permanent installation.” His interest in industrial materials and engineering methods is evident here in the lack of any attempt to domesticate the space as well as in the simple, unadorned furniture he built for it. The NYT ran an article a while ago which included an interview with Judd’s son Flavin, who was 6 months old when he moved into this loft and who nostalgically described the Soho of the 60s and 70s as a small town smelling fragrantly of the cigars manufactured nearby. These days there’s a certain huffiness out there about modernism and minimalism’s supposed kid-unfriendliness, but Flavin Judd remembers this space—ground zero of minimalism—happily and even nostalgically (there’s a small image of the Judds at home, below). “There were “the best Swedish breakfasts on the second floor—50 people would come over—ham, cheese, weird flatbreads, salmon,” Flavin Judd said. “It was a great place to grow up.” To read the whole story, which includes information on the heritage restoration of the whole building, see the NYT. See also this blog’s previous post on minimalism.vs. maximalism in interiors. There’s a good shot of the a reproduction of Judd’s famous daybed on AT , and lastly, Loft Living: Culture and Capital in Urban Change by Sharon Zukin provides an interesting portrait and social history of artist’s lofts, including 101 Spring Street. Photos from the NYT and from DiscoContinental on Flickr. Take a fun quiz (is it a Judd or a piece of cheap furniture?) here. This entry was posted on Saturday, April 25th, 2009 at 11:22 am	and is filed under art, design, furniture, interiors. You can follow any responses to this entry through the RSS 2.0 feed. You can leave a response, or trackback from your own site. Was Flavin Judd named for Dan Flavin. Yes. Donald Judd and Dan Flavin were close friends. You can see a Dan Flavin piece in the loft – the pink fluorescent tube sculpture in the bedroom, along the windows. You might also be interested in this article on Stephen Flavin, Dan’s son, who has conferred with Flavin Judd on the curation and preservation of their fathers’ works.